Samsonite is one of the top luggage manufacturers, and they’ve been at the top for a while. This is because of the excellent quality, design and durability of their suitcases. And, most of time you will not be disappointed with a Samsonite case. In this review, we will take a look at the Samsonite Neopulse, a hardshell spinner suitcase. I have high expectations for this one, not just because it’s a Samsonite, but also because it looks quite promising at first glance. 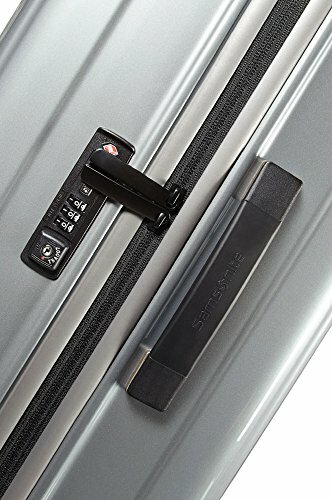 If you want to find out if this piece of luggage fulfilled my expectations, scroll down and read my review of the Samsonite Neopulse suitcase! Is The Samsonite Neopulse Worth Your Money? 20.3" x 14.8" x 7.5"
The Neopulse is fully made of Bayer Makrolon Polycarbonate. This is a really lightweight and durable material. With the 30” version weighing only 8.2 lbs, you can pack plenty items in it without exceeding the 50 lb checked baggage limit. Additionally, the corners of the suitcase are reinforced, providing it with further impact-resistance. Polycarbonate is a durable material, and it also has excellent thermal resistance. However, it is prone to scuffs and scratches, so don’t expect this suitcase to look shiny and new for a long time. The ribbed shell will help with this though, because the scratches will be somewhat less visible. So, that is a big plus. In terms of the closure, the Neopulse features zipper closure. The Neopulse is available in about 6 different colors, depending on the size you want to get. All of the colors have a metallic finish, which really makes the suitcase look beautiful. 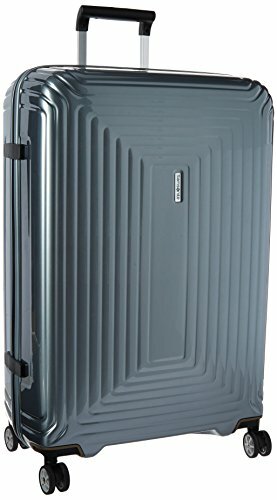 This Samsonite suitcase is equipped with 4 double spinner wheels (as most Samsonite suitcases are). 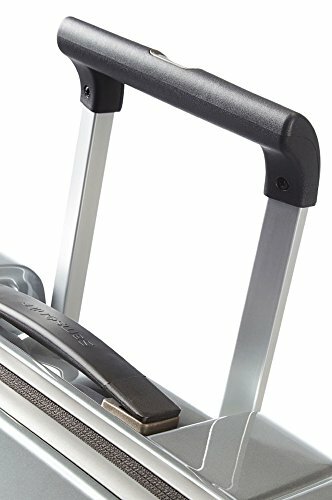 Only more high-end suitcases have double wheels, because they cost more, but are also easier to use. These wheels actually turn 360 degrees each, which allows you to steer this suitcase however you want. And they glide like a dream. You can roll it upright, which puts less strain on your arms and shoulders than having to tilt it. This is an important feature for anyone who travels to the US. The TSA Approved combination lock means that TSA agents can safely open up your suitcase, if they choose to inspect it. With other types of locks they have to open your luggage forcefully which could cause some serious damage to it. The lock is a 3-digit combination lock. The original combination is 000, and you can set up your own in a matter of minutes. Once you set up the combination, only you will be able to access the suitcase (apart from the TSA agents, of course). There are 2 soft touch carry handles on the Neopulse, one on the top and one on its side. As for the main wheel handle, it is extendable, and it can be locked with the push of a button once extended. This handle can also be locked when it is not in use, but unfortunately, it cannot be locked to different height settings. Additionally, there is an integrated address tag just below the retractable handle. The interior of this suitcase is actually what I like the most about it. Both packing compartments are fully lined with nylon, and they can be fully closed off with a zipper, which gives it a very neat look once opened up. This also means that your things will stay in the exact same place you expect them to be. The bottom compartment also features elastic tie-down straps, to further secure your belongings. Did you notice that I didn’t mention any pockets in the compartments? That is because the Neopulse doesn’t have any. Some people will consider this a benefit, as it ultimately allows them to pack more items in the suitcase. However, I really don’t like that Samsonite decided not to include at least a single pocket in one of the compartments, even for some small items like jewelry! It's not a deal breaker, but it would have been nice to have. This is not an expendable suitcase, and in terms of storage space, what you see is what you get. And, while you might not need to expand the 30” version of the Neopulse, it would certainly be a helpful feature on the smaller versions. Expandable suitcases are a must for people who tend to return from their trips with more items than they originally brought, and I am one of them. The telescopic handle can only be locked in one height position, which might not be suitable for everyone. There are a lot of other suitcases with handles that lock in multiple positions, allowing you to choose one that suits you best. The Tumi Tegra is one of those. With the Neopulse, you don’t have that choice, so you better cross your fingers that the height of the handle will suit you. Or, just live with the options it gives you. Some people in reviews I read have had the shell of the suitcase crack within a few trips. I don’t know exactly why this happened; my best guess is that the baggage handlers were extra rough with their suitcases. However, this was a somewhat rare occurrence, so I wouldn’t worry too much about this happening to your suitcase. And even though you will get 10-year limited warranty with the purchase of this suitcase, it does not cover any damage caused to it in transport. In fact, the warranty only covers manufacturing defects. So, big tip here: always have travel insurance! 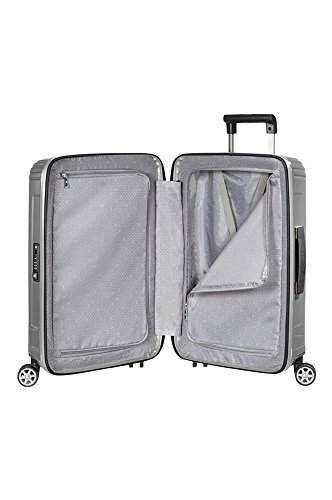 There is not a single pocket on this suitcase. Even though it is common for hardshell suitcases not to have exterior pockets, I’m used to suitcases having at least a mesh pocket inside, on the divider. I consider this to be a big downside, as I usually tend to pack a lot of smaller items in the pockets. Bottom line, for the money there are often better options for a new suitcase. 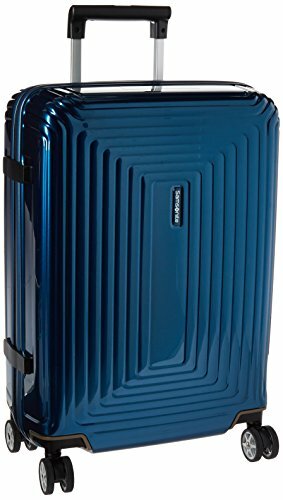 Even though it is not really that expensive, especially when compared to other Samsonite suitcases, I still think you could get a better suitcase in the same price range. The Delsey Helium line is even cheaper, and do you know what those suitcases have? Pockets. So, go check out there review (click the link) and you will see why I like them better! However, even though it might not be the best suitcase out there, it’s not to say that it is not good. After all, it does have spinner wheels, a TSA Approved lock and it is incredibly lightweight. So for minimalists, it's a great buy! It is still a decent suitcase; it is just not up to my (perhaps too high) standards. 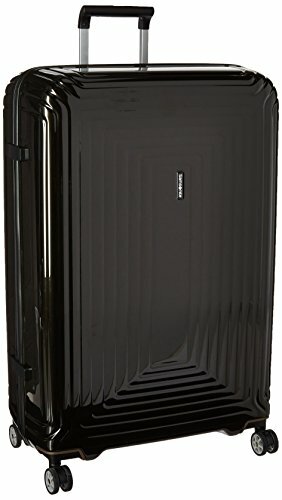 Body Dimensions: 28.0" x 19.0" x 11.0" Overall Dimensions: 31.5" x 21.65" x 11.42"
If you are interested in the Samsonite Neopulse, head on over to Amazon to get a great price on any one of the three!